Berlin attraction-guides.com - Berlin, Germany attractions guide Berlin Zoological Gardens information about attractions, Zoologischer Garten in Berlin Area, Germany DE, world's largest zoo, animals and species, Tiergarten Park, breeding programmes, aquarium centre, location and address, Hardenbergpl. 8 and Budapester Str. 34, tel / telephone number opening hours, admission charges, and general tourist information about Berlin Zoological Gardens (Zoologischer Garten) attraction in Berlin area, Germany DE Deutschland - Last updated 30/10/2012. The Berlin Zoological Gardens was opened in 1844, and has grown into the world's largest zoo, with more than 14,000 animals and 1,700 different species. Located in the south-western corner of the Tiergarten Park, The Berlin Zoological Gardens is the oldest zoo in Germany and after being destroyed during World War II, the zoological gardens were carefully redesigned to create habitat as near to the animals' natural environment as possible. This has resulted in very successful breeding programmes, including high birthrates for many rare and endangered species. 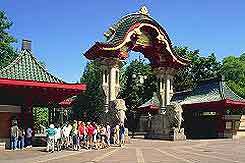 The main entrance to the zoo is through a beautiful Asian-style Elefanentor (Elephant Gate). Next door to this magnificent zoo is an enormous aquarium centre, with a magnificent collection of fish and also some reptiles.